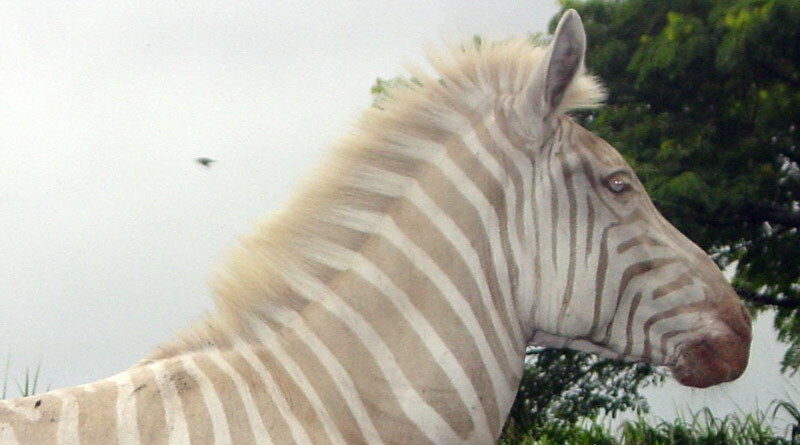 Hawaii’s golden zebra Zoe has died at the age of 19 at the Three Ring Ranch Exotic Animal Sanctuary on the Big Island. Zoe was born on Molokai to a mare named Oreo. Her golden coloring is because she has amelanosis, giving her golden stripes instead of the usual black, and blue eyes. The condition occasionally occurs in the wild, but it means the animals with it are easier targets for predators. Amelanosis (also known as amelanism) is a pigmentation abnormality characterized by the lack of pigments called melanins, commonly associated with a genetic loss of tyrosinase function. Amelanism can affect fish, amphibians, reptiles, birds, and mammals including humans. This was from the same area from where Oreo was captured, so it is likely that all of the golden herd are related. It was noted that Zoe had poor night vision, and her keepers were careful to feed her a low protein diet in case of kidney problems, and monitor her for signs of sunburn or skin cancer. Ranch director and curator Ann Goody told Hawaii News Now that having Zoe was “as close to having a unicorn around as you can get”. She was the star attraction at the ranch, and Goody estimated she had more than 12,000 visitors over the years. Goody said that at one point a man from Texas offered the sanctuary $1 million for Zoe, and intended to hang her hide in the entryway of his home. Zoe’s mum Oreo lived to the grand age of 28.